Funded as part of a state-wide program to upgrade or replace outmoded courthouses, the project will replace the current courthouse and annex with a modern, secure courthouse for all case types and functions. The new facility will provide 5 courtrooms as well as jury deliberation rooms, a self-help center, a children’s waiting room, family court mediation, attorney interview/witness waiting rooms, and secure circulation for court staff and visitors. Paired street trees link the courthouse to other important civic buildings on Fourth Street, including the Sheriff’s office, the existing courthouse and the adjacent historic district. A ceremonial entry plaza and stairs mark the public entry to the courthouse at the corner of Fourth and South Streets. A small, secure courtyard for use by court staff is located on the west side of the building. 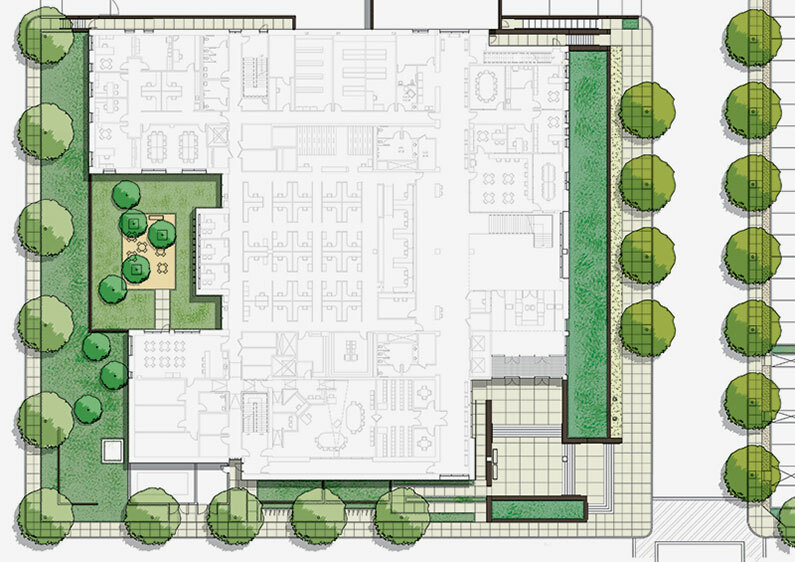 The planting design will include deciduous shade trees to provide shade in the summer and sun in the winter. There will also be seasonal interest through the use of flowering accent trees and groundcovers. The plant palette will be selected from native and adaptive species to reinforce the regional character of the site.